Indulge and Relax with a luxury pampering spa gift basket filled with pampering gifts. 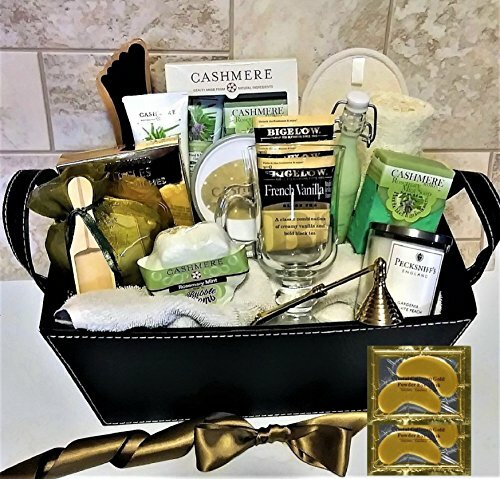 Includes: Oversized Bath Towel, Bubble Bath in Glass Bottle, Gold Eye and Facial Gel Masks, Bath/Shower Gel, Lotion,Bath Bomb, Bath Salts, Sugar Scub, Soap Bar, Loofah Sponge, Foot file, Spa Slippers, Loofah, Aromatherapy Candle and Brass Snuffer, Latte Teas, Tea Glass, Keepsake Faux Leather Storage Basket. Beautifully wrapped with crisp clear cellophane, ribbon and your gift message card.